AUBERY (Auberi, Aubry), JOSEPH (Jacques), Jesuit priest, missionary; b. 10 May 1673 at Gisors (dept. of Eure), France; d. 24 May 1756 at the Saint-François-de-Sales mission (Odanak, Que.). Joseph Aubery at 17 years of age entered the Collège Louis-le-Grand in Paris, where he studied under the direction of Father Joseph Jouvency. He had the reputation of being a timid and frightened student. Yet he requested permission to continue his studies in Quebec, and he arrived there in 1694. While pursuing his theological studies he taught at the Jesuit college in Quebec for five years. Ordained a priest by Bishop Saint-Vallier [La Croix*] on 21 Sept. 1699, Aubery then devoted himself to studying the Abenaki language at the Sault de la Chaudière mission, and in 1701 he was entrusted with founding a mission for the Malecites, allies of the Abenakis, at Médoctec (Meductic, N.B.) on the Saint John River. From his arrival in this region of mainland Acadia, he championed a policy aimed at uniting all the Abenakis in the territory of New France, to shield them from English influence. It seems that Father Aubery travelled into every part of this hilly region and got to know it better than anyone else. In 1709 Aubery had to replace Father Jean-Baptiste Loyard*, who had temporarily taken over the running of the Saint-François-de-Sales mission on the shores of the Rivière Saint-François, where the largest group of Abenakis “domiciled” in New France was located. In a letter to his former teacher, Father Jouvency, Aubery alluded to the difficulties of his ministry. He had to fight against “drunkenness, arrogance, and superstition.” But the formerly timid student had greatly changed: he had become eloquent, and his vehemence as well as the rigour of his oratory had helped him persuade the elders to take responsibility for the practice of virtue in the mission. Thus Father Aubery rapidly acquired great influence over his flock, and he soon became a specialist in the Abenaki language. In handing over to England Acadia “with its ancient boundaries,” the treaty of Utrecht (1713) created a difficult situation for the Abenakis on the Atlantic coast, who were now on territory claimed by both crowns. Fully aware of the danger, that same year Aubery sent to the French court a report, accompanied by a map, which suggested clear boundaries between the English and French territories, in order not to allow “the English, in peacetime, to spread out, advance, and settle on our lands, and in that way become masters of Canada.” “To be beyond dispute,” he added, “these boundaries could only be the high grounds; but to set them there means giving away a great part of New France, since these high grounds are very near the St Lawrence River.” Father Aubery therefore suggested: a definition of Acadia limiting it to the present-day peninsula of Nova Scotia; a post (the former fort of Pemaquid) to mark the boundary of New France and New England on the Atlantic; and the drawing of a line from this point, following the high grounds, to obtain “a fair and indisputable boundary between the lands which are considered to belong to one or the other.” But this report and the map which Father Aubery had prepared with the help of Intendant Bégon made no lasting impression upon French policy, and mainland Acadia continued to be a disputed area. It was at this point that in 1715 Father Aubery again took up his idea, formulated in 1703, of uniting all the Abenakis into a single village, and he proposed joining the Bécancour mission with that at Saint-François, “which is the most advantageous post in the colony in relation to the Iroquois in time of war and very appropriate for creating a strong settlement, since it has a great stretch of land which is very good and very suitable for the Indians.” At the same time he tried to dissuade Atecouando*, an Abenaki chief who since the war had taken refuge with 60 warriors at Saint-François, from returning to re-establish his former village not far from New England, pointing out to him “the disadvantages which he himself will suffer from this re-establishment.” In this way the missionary took an active part in the policy of the French government, which wanted at all costs to preserve the alliance with the Abenakis. 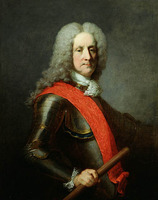 Like his superior, Father Pierre de La Chasse, Father Aubery probably had some part in the declaration of war which in 1718 opposed the Abenakis to the Anglo-Americans in New England. Indeed, in 1720 Aubery sent a second report to the court of France on the question of the boundaries of Acadia. In 1721 he received at his mission at Saint-François Governor Vaudreuil [Philippe de Rigaud*], who had come to meet the Abenaki warriors. He was, moreover, in close correspondence with Vaudreuil on all questions relating to the war. 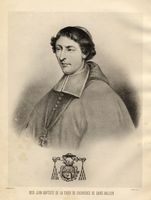 In 1725 he sent Father Louis d’Avaugour*, procurator in Paris of the Jesuit missions in New France, a report in which he stated: “The war is very necessary if we do not want to run the risk of losing as of now all the shore of the St Lawrence River.” In 1726 the missionary wrote in the same vein to Father Jean-Baptiste Duparc, Father La Chasse’s successor; he told his correspondent specifically: “Religion has up till now been the only motive that has made the Abenakis French, and as soon as there are no more missionaries they will become English and will be capable by themselves of putting the English in possession of the whole country at the first war.” We may, however, believe that the missionary endeavoured to the best of his ability to make this “just and necessary” war less harsh by receiving and ransoming the numerous prisoners brought back from the expeditions into New England. Since the mission records were destroyed in 1759, there is no evidence of the priest’s having made any gestures of this sort; nevertheless we know that in 1720 he ransomed and converted young Dorothy Jeryan, who later joined the Ursulines of Quebec. After peace between the English and the Abenakis was signed in 1726 and ratified in 1727, Father Aubery received at Saint-François the Indians who had survived the destruction of the villages of Narantsouak (Norridgewock, now Old Point, Madison, Maine) and Pentagöuet (Castine, Maine). But despite his desire to do so, he did not succeed in keeping all the refugees from New England. In 1733 a smallpox epidemic led to the departure of a number. Others tried to found a new village on Missisquoi Bay, where communications were much easier. In 1738, Father Aubery induced the governor of Trois-Rivières, Josué Dubois Berthelot de Beaucours, to forbid Jean-Baptiste Jutras, dit Desrosiers, seigneur of Lussaudière, “to allocate for settlement a part of his land grant which was adjacent to the Indians, on the plea that cleared lands would, by driving the game away, cause the Indians to go off elsewhere.” The Abenaki village of Saint-François-de-Sales was in fact built on his lands. The seigneur of Lussaudière tried to have the ordinance annulled, but he was unsuccessful, because Versailles was trying to keep the Abenakis under French influence, and it was at Saint-François that they could best be kept under control. 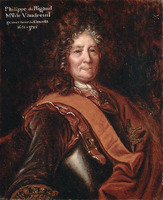 In 1744, war having again broken out between the two crowns, Father Aubery tried to obtain from Governor Charles de Beauharnois permission for the arrest of an undesirable German who had been living in the village for two years, since he feared that he would return to live among the English and suspected him of being a “dangerous spy.” Certainly there were grounds for fearing a leakage of information, as the Abenakis from Saint-François had since the beginning of the war been making “continual raids” on the territory of New England, sowing terror and destruction. The missionary kept abreast of all movements: in 1747 he was at Quebec to give a report on the activities of “his” warriors; in 1749 he was at Montreal to supervise the exchanges of prisoners. After peace was signed in 1748, the missionary decided in 1749 to renew the Abenakis’ vows to Notre-Dame de Chartres and wrote to this effect to the dean of the chapter of the cathedral of Chartres, France. This letter was countersigned by the five Abenaki chiefs of the village of Saint-François, one of whom was Atecouando, and gave witness that in peace as in war the piety of the Abenakis was as ardent as at the time of Father Jacques Bigot*. In 1752 the Saint-François mission was visited by the engineer Louis Franquet, who was making a tour of inspection of the fortifications of New France, but Father Aubery was absent. The engineer’s visit perhaps took place just at the time when the Jesuit was attending negotiations in July between the English and the Abenakis. In 1756 Father Joseph Aubery died peacefully at Saint-François, at 83 years of age. He left behind him a well-organized mission endowed with a magnificently decorated church which possessed, along with other objects, a huge banner given to the missionary by Marie Leszczynska. He also left numerous works in Abenaki which he had written for the instruction of young missionaries. But above all he left the memory of a patriarch who had been completely devoted to the cause of his people. The reputation he enjoyed during his lifetime, his long years of apostolate, and especially the spelling of his name probably explain why in the 19th century some commentators identified him with Father Aubry, immortalized by Chateaubriand in Atala. As Thomas Charland has rightly shown, this opinion does not stand up to an analysis of the facts and the texts. AAQ, 12 A, Registres d’insinuations A, 805, 806, 807. AN, Col., B, 47, ff.1129, 1206; 48, ff.180–205, 855, 909; 50, ff.500–9, 531, 538v; 52, ff.516v, 547v, 586; 53, f.541v; 54, f.432v; 57, ff.652v–65; 58, ff.461v, 470v, 480; 64, ff.432v, 438v, 442; 65, ff.423v–27; 68, f.20; C11A, 34, ff.8–9; 35, ff.15–51; 49, ff.124–28; 91, f.12; C11E, 2, ff.63–69, 90–94; F3, 24, f.299. ASJCF, Fonds Rochemonteix, 4003, 108–11; 4006, 129, 130–33, 285–86; 4018, 57, 85–90, 105–6, 296, 363, 438; 4023, 229, 233. ASQ, Lettres, O, 28; Tiroir, 217, 14. Charlevoix, History (Shea). F.-A.-R. de Chateaubriand, Atala, Armand Weil, édit. (Paris, 1950). Coll. de manuscrits relatifs à la N.-F., II, 405–6, 567; III, 23, 57–61, 78–91, 108–10, 132–33, 140, 146, 160, 161, 167, 169, 172–73, 182–85, 356, 359, 490, 505–6, 509–12, 515–18. “Correspondance de Vaudreuil”, APQ Rapport, 1938–39, 12–24, 159–74; 1946–47, 427–37; 1947–48, 230–38. Franquet, Voyages et mémoires sur le Canada, 174–76. “Le gouverneur de Vaudreuil et les Abénaquis; paroles des Abénaquis à monsieur le marquis de Vaudreuil,” BRH, XXXVIII (1932), 569. JR (Thwaites). “Lettre de M. de Rigaud de Vaudreuil au ministre (2 septembre 1749),” BRH, XLIV (1938), 376–77. “Lettre de MM. de Vaudreuil et Bégon au ministre au sujet des affaires des Abénakis (14 octobre 1723),” BRH, XLI (1935), 624–29. “Lettre des sauvages abénaquis au roi,” BRH, XXXVII (1931), 368–40. [J.-F. Le Sueur], “Histoire du calumet et de la dance,” Les soirées canadiennes; recueil de littérature nationale (Québec), [IV] (1864), 114–35. A narrative of Mrs. Johnson’s captivity among the French and the Indians (Boston, 1798). “Paroles des Abénakis,” BRH, XXXIX (1933), 546–49.“Paroles des Abénakis à monsieur le marquis de Beauharnois,” BRH, XXXIX (1933), 574–76. [Melançon], Liste des missionnaires jésuites. Tanguay, Répertoire (hand-written annotated edition by the archivists of the Séminaire de Québec). Charland, Les Abénakis d’Odanak. Coleman, New England captives, I, 28; II, 242–48, 293, 306, 389–90, 401. Charles Gill, Notes sur de vieux manuscrits abénakis (Montréal, 1886). J.-A. Maurault, Histoire des Abénakis depuis 1605 jusqu’à nos jours (Sorel, Qué., 1866). Luc Merlet, Histoire des relations des Hurons et des Abnaquis du Canada avec Notre-Dame de Chartres, suivie de documents inédits sur la Sainte Chemise (Chartres, France, 1858). Rochemonteix, Les Jésuites et la N.-F. au XVIIe siècle, III, 367, 397–408; Les Jésuites et la N.-F. au XVIIe siècle, I, 25–28; II, 12–19. Benjamin Sulte, Histoire de Saint-François-du-Lac (Montréal, 1886). T.-M. Charland, “Chateaubriand a-t-il immortalisé le père Aubery,” RHAF, XVI (1962–63), 184–87. Désiré Girouard, “L’étymologie du mot missisquoi,” BRH, XI (1905), 270. Micheline D. Johnson, “AUBERY, JOSEPH,” in Dictionary of Canadian Biography, vol. 3, University of Toronto/Université Laval, 2003–, accessed April 22, 2019, http://www.biographi.ca/en/bio/aubery_joseph_3E.html.